Our journey started very early on Thursday morning, some of us leaving our homes at 4.30am. Bad moods slipped away as the group met at the airport and began to check-in. We needed to get through departure quickly to have time to get gifts for our coaches. The big question was 'What to buy?'... Our nervousness to get the right thing, heightened by the fact that the UK has only meagre food offerings in comparison to the Italians. We'd been briefed to get whiskey and other alcoholic drinks, with no decision making skills at that time of the morning, this is what most of us got. Leaving overcast Stansted we arrived in a crisp, cold and sunny Pisa. We were lucky, it was weather which would stay with us for the entire trip. The bus ride to Siena was scenic and through hooded, drowsy eyes we tried to see the Tuscan countryside: sunny hills with olive trees, little scattered houses each with it's own oil press and wine yard. We were welcomed by Gabriele, our host and owner of the Villa Fiorita who showed us to pleasant rooms within a grand house - large wooden stairs, high ceilings, antiques and chandeliers - it was all very impressive. 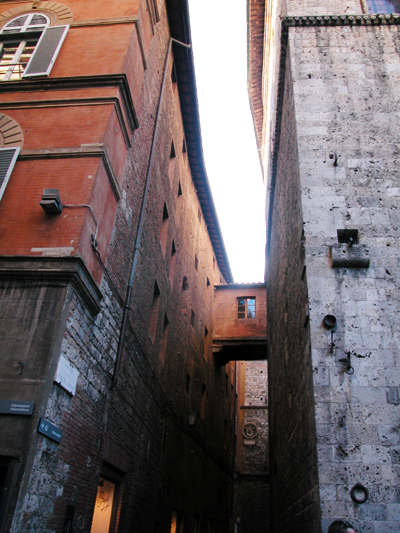 Starving we headed into the walled city of Siena, to eat, look around and get our bearings - our first impressions were of quiet, narrow swirling streets, tall buildings with odd architectural details catching the eye. 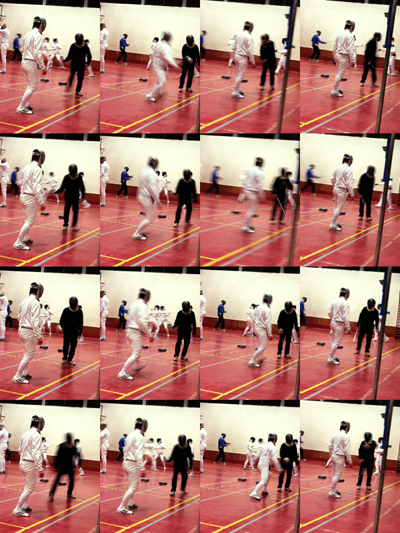 Time to wander was running out as our first, of the three, fencing sessions with our Italian hosts was to start at 6pm. Feeling quite nervous we got ready for our introduction. We knew they were good, the Maestro D'Argennio having coached the Italian womens olympic team. 'What are they expecting?'... 'Do they know how novice some of us are?'... 'Will they be disappointed?'... With these thoughts and the added stress of leaked shampoo bottles into masks, new breeches to get used to and heart palpitations we entered the sports hall. Our worries were unnecessary, we received a lively and warm welcome. After a non Dumi-esque (and thankfully easier) warm up, we were split into our weapon groups and introduced to our young, yet experienced coaches - Francesco, Matteo, Marco, Filippo, Enrico and Alessandro. 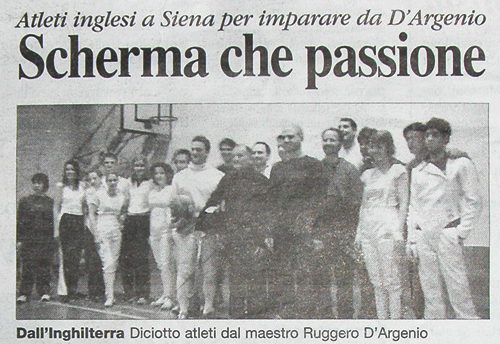 Multiple photos were taken of us altogether, one of which turned up the next day in the sports section of Siena's newspaper, Corriere Di Siena, surprisingly declaring us as 16 British athletes. Within the three hour session, everyone had one-to-one coaching in their chosen weapon and plenty of time to practice with others or fight. 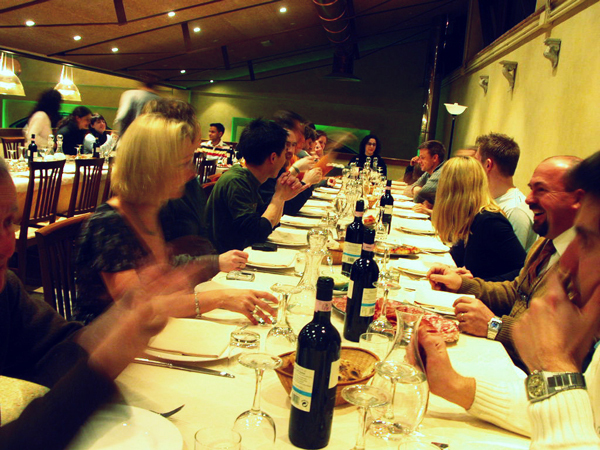 With the session over, late night eating and drinking was embraced with gorgeous Italian food and wine. Once back at our villa the whiskey bottles, intended for the coaches, were swiftly opened. The fretting began... 'Have we bought the right kind of gifts?'... 'Is malt whiskey their kind of thing? - surely alchopops would go down better?'... and more importantly 'Could we open another bottle?'. Twenty three hours after we started our journey it was time for sleep. The next day we were guided around the city by Gabriele and Alessandro, both were happy to explain everything we were curious about. Our interest to know, with Ian expertly translating, increased their enthusiasm to show us more. We quickly moved around the streets, squares and cathedrals, cramming in so much into the short time. Their kindness extended to inviting us to see their Contrada (district) Palio Museum and Church, something which is rare for tourists to see. After our second and fast moving fencing session, an invitation to eat with the club was another special gesture from our hosts. Again great food and wine - which of course lead onto more drinking at a Scottish themed pub, Robert the Bruce, and then onwards to our villa for more wine which had been kindly given to us. They had shown us so much – in fencing and sightseeing - the least we could do was impart the tradition of northern European boozing... Sleep came at 6am. With large hangovers and feeling fragile, Tim somehow persuaded everyone to drag themselves over to Il Campo, the main square, for 1pm. Suzanne and Kari-Anne got the short straw, having to put on a fencing demonstration to an audience. The rest of us were glad to lie in the sun, drink water and watch. Finally, our last fencing session was organised as a competition. Two teams, thankfully split in a balanced way, mixing the talent of the Italian coaches and their club members with us. Everybody had benefited from the coaching over the past few days and the relay allowed for a healthy rivalry to grow. As expected one team won and the other lost. There were no real losers on this trip, as we all had made friends within our own club and especially with the Italian coaches and fencers of Circolo Scherma UISP Siena. The visit was really too short and we were all quite sad to leave, now we can only look forward to more exchanges in the future. stop here the whole crowd of assassins! A healthy Italian meal as many times as possible. Wish you were there? 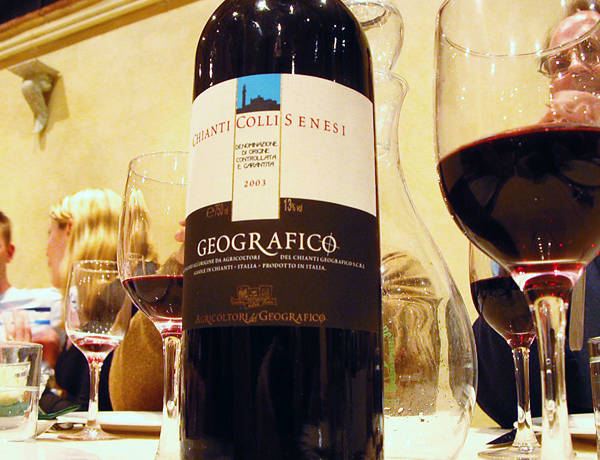 euro on wine each year. That's the way we like it.